What is the feeling of getting closed to death? The 72-year-old Nguyen Khac Chuong had experienced this deeply. Since he was detected stomach cancer of late stage in 2010, he has accepted 7 times of treatments in Modern Cancer Hospital Guangzhou. In past 3 years, he has persisted and successfully fight cancer when most late-stage cancer patients would rather give up. When was asked about the feeling to fight cancer, he only said: “ Keep going.” This is also the truth against cancer, which he has proved by 3 years facing death closely. He was an official of Department of Defence of Vietnam who has contributed to Vietnamese people all his life time. Just 10 years ago, he retired and started to enjoy the life of family. It would be a peaceful and happy life if no other problem, but it was smashed by cancer in 2010. 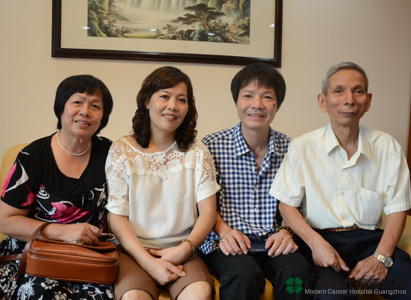 “ We took him to hospital for examination when we noticed his yellowish face, and a big malignant tumor was found in his stomach.” Sister of Nguyen Khac Chuong said when recalling the onset of this cancer. The family took him to 108 Hospital of Vietnam for surgery, in which 3/4 stomach was removed. Nguyen Khac Chuong had suffered from fever after surgery, and the cancer also spread to lungs, which is the sign of late stage. He lost confidence to the medical treatments in Vietnam because of this, but turned to Modern Cancer Hospital Guangzhou, to which the family was against. “ They thought it was too far for me to go to China. But I knew here is the more advanced treatment technology that I believed I can have better chance here.” He said when remembering that. 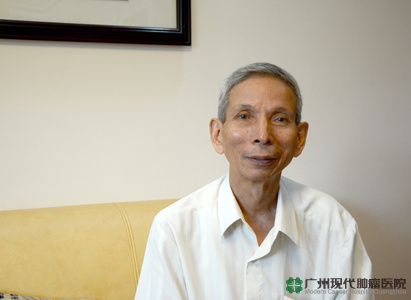 In July, 2010, he came to Modern Cancer Hospital Guangzhou for examinations again, in which not only his lungs, but also esophagus and liver were found of cancer cells, and his condition was serious. As it needed some time for the interventional therapy and immunotherapy, designed by Modern Cancer Hospital Guangzhou, to relieve his symptoms that his physical condition did not improve obviously in a short time, there came more voices against his treatment in China, and even thought he should give up the treatment as a patient in late stage. He just kept going on treatment when the family and others were all against him. “ I’m the one who only know my body.” Nguyen Khac Chuong said. “ I felt my body is recovering obviously after treatment. And I know I have to keep on and trust the doctor completely. Only that I can get rid of the disturbance of cancer, even it is in late stage.” He added firmly. Actually, he made it through. His body gets better after 3 years of treatments, and now he is out of treatment and can have a healthy life as normal people. Upon his improvement, the family was thoroughly convinced, and trusted Modern Cancer Hospital Guangzhou. They thank hospital so much and think hospital has saved Nguyen Khac Chuong. We all understand, Nguyen Khac Chuong is the one who saved his own by his perseverance.